Now is the time to invest in the Middle East and North Africa (MENA). This is not a sentiment you hear expressed very often. But while the political instability across the region is likely to cause investor apprehension and economic contraction, there are many good reasons to invest there now. The unprecedented political and social transformation taking place offers tremendous opportunities to address the economic disparity and lack of opportunity faced by the majority of the region's population today. David Weiss, President of CHF International, Craig Newmark, founder of Craigslist, and Elissa McCarter, Vice President for Development Finance discuss lending the in the Middle East and North Africa. Supporting entrepreneurship and the growth of small businesses is one of the most effective ways of helping the people of the region in these turbulent times. More sustainable businesses and a healthy private sector will accelerate more equitable economic growth and job creation. In Egypt, for example, small and medium enterprises (SMEs) are already the driving force in the economy, representing 90 percent of businesses, representing approximately 80 percent of the country's GDP and growing at an annual rate of six percent from 2006 to 2008. However, despite a number of interventions and credit enhancement schemes to try to increase access to finance, SMEs in MENA at large still suffer from a lack of the financing needed to expand, grow and create new jobs. According to a recent IFC / McKinsey study, there are between 1.9 and 2.3 million formal SMEs in the MENA region, and the SME financing gap is estimated to be in the range of $110 billion to $140 billion. SME lending as a percentage of total lending for banks in MENA averages eight percent -- far below OECD countries where SME lending averages 27 percent of total lending. This is despite the fact that most major banks in the region hold abundant loan capital and are generally underleveraged. Although more than half of the formal SMEs in MENA maintain bank accounts, most do not have access to credit. Microenterprises on average only employ a few people -- but they do create job opportunities where very few exist. 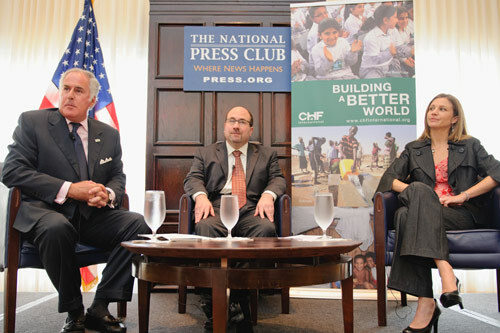 Last month, I had the opportunity to moderate a discussion between Elissa McCarter, CHF International's Vice President for Development Finance and Craig Newmark, founder of craigslist.org, at an event at the National Press Club where we discussed the role of socially responsible lending in the Middle East. As Craig stated, "The best thing you can do for another person is help them get a job. Microfinance makes that happen -- in very real and sustainable ways." CHF International supports microentrepreneurs and SME's across the Arab world, and the jobs these programs create change lives. One individual we supported was Jassim, a young Iraqi entrepreneur who was the sole supporter of his three younger siblings after his father, who worked in plumbing and auto shops in Baghdad, was killed by a criminal gang. The young man began to work in a small car repair shop near his home, but without much training. When he heard about the financial products CHF offers to small businesses, he immediately applied for a business loan. With the money, he bought extra tools and decorated his work shop. A few months later, business had grown enough to hire three new workers. After fully paying off his first loan, Jassim applied for a second loan to buy a new car painting machine. This was the first time Jassim had access to capital, and that's all it took to get him to start one of the most popular auto shops in his town. As a young business owner, he is providing sustainable employment to members of his community and bettering the quality of life for his family and the families of his employees. Across the region, our repayment rates are above 98 percent, despite the constant upheaval in countries such as Iraq and Lebanon or territories like Gaza. This may seem to contradict expectations and it is important to remember that the people receiving loans are from the working class. In times of tumult and political change they cannot flee, cannot move overseas. They have to live and earn a living throughout any and all circumstances. Their determination, focus and honesty are unparalleled. The transformation taking place today in MENA is a signal that now is the time to invest, and to invest in people that matter most. It is people like Jassim who, hardworking and courageous, when given the right tools will contribute to the development of their countries. With change come tremendous opportunities for us to engage more deeply with both new policy makers and young entrepreneurs alike, to work toward positive permanent change and stability. Learn more about lending in the Middle East and North Africa.